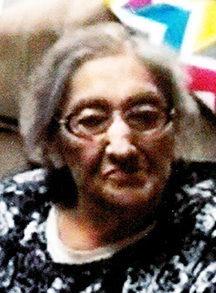 LEIPSIC – Ofelia R. Hernandez, 81, of Leipsic died 2:15 p.m. Tuesday, March 26, 2019 at The Meadows of Leipsic. She was born January 23, 1938 in Elsa, TX to the late Genevevo and Santos (Castillo) Rosa. She was married to Maurilio Molina, Sr. and he passed away. Later she married Roberto Hernandez who died May 6, 1994. She is survived by four children, Rita Navarro of Austin, TX, Ruth (Jesus) Guerrero of Ottawa, Maurilio Molina, Jr. of West Leipsic, and Sandra Coleson of Ottawa; 10 grandchildren; 19 great-grandchildren; and a sister, Anna Gonzalez of Leipsic. She was also preceded in death by two brothers, Samuel and Daniel Rosa and a sister, Oteotila Pena. Ofelia was a nurse’s aide at Oak Grove Manor in Deshler. She attended St. Mary’s Catholic Church, Leipsic. A Funeral Mass will be held 10:30 a.m. Saturday, March 30, 2019 at St. Mary’s Catholic Church, Leipsic with Fr. William Pifher officiating. Burial will follow in Sugar Ridge Cemetery, Leipsic. Visitation will be from 2 to 8 p.m. on Friday and one hour prior to mass on Saturday at Love-Heitmeyer Funeral Home, Leipsic. Memorials may be made to a charity of the donor’s choice.